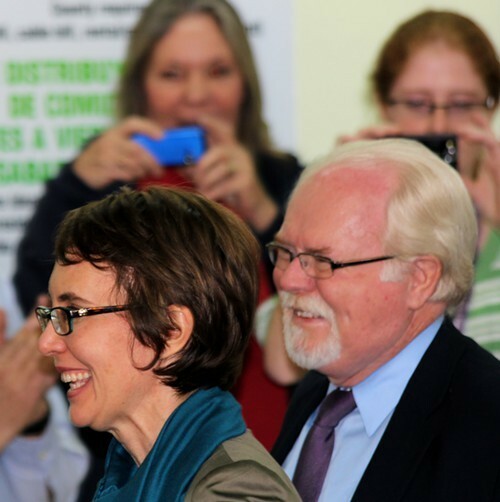 Ron Barber touring the Community Food Bank of Southern Arizona with Gabrielle Giffords during her final day as a congresswoman in Congressional District 8. It appears increasingly likely that Ron Barber, who has served as the district director for Congresswoman Gabrielle Giffords since her election in 2006, will enter the race to finish out her term in Congressional District 8. "I would be shocked if we didn’t hear an announcement soon that Barber is running for the interim position and that Team Giffords doesn’t endorse him in that run," says Jeff Rogers, chairman of the Pima County Democratic Party. The 66-year-old Barber, who was nearly killed after being shot twice on Jan. 8, is not likely to run for the new Congressional District 2 later this year. Barber's entry into the race will likely clear the Democratic field, with aspiring candidates now free to build campaigns to battle it out in the Democratic primary for the new Congressional District 2 seat. If that's how it plays out, Barber will face the winner of the April 17 GOP primary. Three Republicans—state Sen. Frank Antenori, 2010 nominee Jesse Kelly and businessman, sports broadcaster and rugby coach Dave Sitton—have already announced bids in that contest. Barber's entry into the race would put the GOP candidates in something of a political bind: At least two of them will lose in the primary and the winner will have exhausted a significant amount of campaign funds before needing to pivot to face Barber, who will have Giffords' seal of approval and an enormous amount of goodwill among voters. After the special election is decided on June 12, the Republican candidates will have to decide whether to mount new campaigns for the regular election later this year in the new Congressional District 2 against Democratic candidates who have had the opportunity to build their campaign organizations. The new CD2 covers much of the same territory as the current CD8, although it does not include GOP-heavy precincts in Marana, Oro Valley and SaddleBrooke. The voter registration is essentially evenly split between Democratic and Republican voter registration in the new district, eliminating what had been a slight GOP edge in CD8. "I've never aspired to public office, but I've always wanted to serve in some capacity and give to the community, which is just what I've done," Barber says. Barber spent most of his 30-plus-year career with the state heading up the Southern Arizona branch of the state Division of Developmental Disabilities. Although he served for a few years as acting head of the entire division in the late 1980s, he was happy to relinquish control and return to Southern Arizona. "I couldn't wait to get back to the regional directorship, where I could talk to a family that had a child with disabilities, or meet with a group of people with disabilities. Or I could influence or help set up a new program," he says. "For me, that's where it's at." He's proud that during his tenure, the state closed down homes for the mentally challenged. "I believed we had to get people out of institutions in a proper way, with the level of coverage and support they needed to be successful in the community," Barber says. He quit the job in early 2006 to help Giffords win the Congressional District 8 seat, and when she asked him to run the district office, he accepted the job. He remembers that she told him she wanted to deliver the best constituent service in the country. "That was her priority," says Barber, who helped build a staff of people who had experience in social work. Before he can get back to his job, Barber has a lot of healing to do. He can control the pain in his leg through medication, but walking remains a struggle. He can only hope that his nerves regenerate; the doctors tell him it's a slow process, so he may have to wait a year or more before he knows how much feeling he'll recover. "There is no treatment for it," he says. "You just have to wait and see." Then there's the emotional toll. In the weeks after he got out of the hospital, he had a lot of trouble sleeping. "I was playing the tape over and over again in my head," he says. "Nothing in my whole life even remotely prepared me for something like this. It was just horrific. And I know I'll be dealing with it forever." Barber remembers standing a few feet from Giffords and talking to federal Judge John Roll when the gunman rushed up to Giffords and shot her in the head before turning the gun on him. He didn't realize he'd taken bullets to the face and groin until he saw he was lying in a puddle of his own blood. Gabe Zimmerman, the District 8 office's "constituent whisperer" who had worked with Barber since the 2006 campaign, was shot dead next to him. Even as he struggled to remain conscious after members of the crowd subdued Jared Lee Loughner, 22, Barber was thinking of Giffords. He ordered her intern, Daniel Hernandez, to stay with the congresswoman, whose life may have been saved by Hernandez's first-aid efforts. "I remember saying to him, 'Daniel, I'm fine. Go to Gabby. Take care of Gabby,'" he says. Through the haze, he tried to find his missing Blackberry so he could begin making phone calls. A bystander, Anna Ballis, was applying pressure to Barber's mangled leg; her husband eventually had to force Barber to lie back until paramedics arrived and airlifted him to University Medical Center. Barber has learned a lot about anatomy from his doctors. They tell him the shot that tore through his cheek and neck missed the carotid artery by 2 millimeters. The other bullet blew out the femoral vein but only nicked the femoral artery. Trauma surgeon Peter Rhee's team managed to save his left leg from amputation by grafting veins from his right leg. He's struggled through complications since leaving the hospital, including some worrisome swelling in his leg after he attended a January memorial service for Brian Terry, a Border Patrol agent who was killed in the line of duty in December. It's not in his nature to take it easy. Barber has felt the calling to public service since his days at Rincon High School, where he served on the student council after coming to the United States from England with his parents. "Like most converts, I'm really enamored with the American system," he says. As he came of age in the 1960s, he saw some of his heroes—John F. Kennedy, Bobby Kennedy and Martin Luther King Jr.—killed by assassins. "It was like a shattering of dreams," Barber says. But his optimism about America has not dimmed. "In spite of everything that's happened in our country in the last two years and all the harsh rhetoric, I still believe you can get things done that are good," he says. "That's why I do what I do in public service, and that's why I work for Gabby." He remembers talking with Giffords late one night at the end of a road trip about why they were here on the planet. "She sort of summed it up by saying, 'I think we're here to care for each other,' and I really believe that," Barber says. "We stumble and make mistakes and don't get everything right, but I think that's our real purpose."